Having started and sold some fast growing businesses in my past, I’m sometimes asked what my “secret” is. I usually say it’s 90% attributable to hiring great talent, but the second secret would be a content marketing strategy. As in, don’t think about hiring a marketer, think about hiring a (social media savvy) writer and editor. Although we’ve never met in person, my coach over the years in this area has been Ann Handley. I, along with 382,000 of her closest friends, subscribe to her MarketingProfs e-newsletters and I gobble up every issue. So I was delighted when our mutual editor at Wiley sent me a copy of Ann’s new book (co-authored with marketer, C.C. 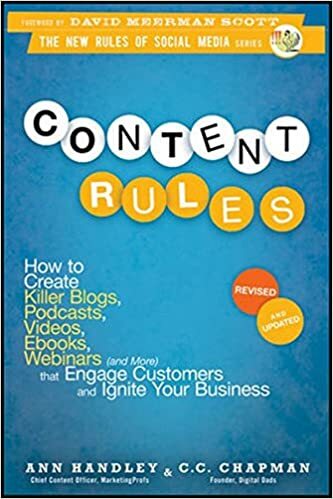 Chapman), Content Rules: How to Create Killer Blogs, Podcasts, Videos, Ebooks, Webinars (and more) that Engage Customers and Ignite Your Business. Now that’s a title! There is great advice and how-to information throughout, including pithy and insightful chapter titles like, “Share or Solve; Don’t Shill.” But the best advice in the whole book is to “Create a Publishing Schedule”. This makes all the difference in the world. The explanation for this is many pages long (so just go buy the book already!) but here is a condensed version. Having a plan, a schedule, and batching times when you create content are the real secrets to successful content marketing. From strategy and case studies to specific tactics, Content Rules is the highly valuable to anyone who is trying to build relationships and their brand online.